Few eras photograph quite as well as the Golden Age of Hollywood, which is excellent news for Tinseltown itself. Because few eras seem to be of as much interest to contemporary filmmakers as Los Angeles when the big studios were humming; Hollywood loves making, watching and awarding movies about movies, particularly if the whole operation is sepia-toned. The news that the Coen Brothers are tangling with old Hollywood was exciting, particularly since the eminently talented screenwriters are on an incredible, ten-year hot streak. The assembled cast for Hail, Caesar! is filled with legitimate movie stars with classic silver-screen looks: George Clooney, Scarlett Johansson, Channing Tatum, Tilda Swinton, Josh Brolin and plenty more. The pieces are all there. The movie just isn’t very good. It’s not bad by any means, but it’s well below its own pedigree and the standard established by its creators. The clearest reason seems to be the script’s focus on Brolin’s character, studio fixer Eddie Mannix. 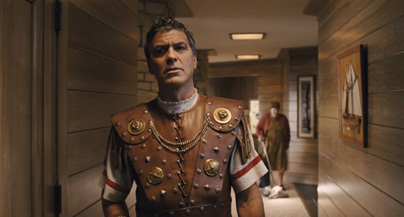 A tireless addresser of ego-driven dilemmas, Mannix weaves from one film set to the next, never sleeping and rarely stopping at home; Hail, Caesar! is, roughly, a day-in-the-life picture of this character. Unfortunately, he’s the least interesting character in the film. Johansson is more compelling as DeeAnna Moran, a faux-innocent starlet with an inconvenient pregnancy; Alden Ehrenreich is intriguing as Hobie Doyle, a Western star struggling to transition out of the genre; and George Clooney is the clear star of the film as Baird Whitlock, a top star kidnapped by a group of grey-haired communists while filming a Biblical epic.